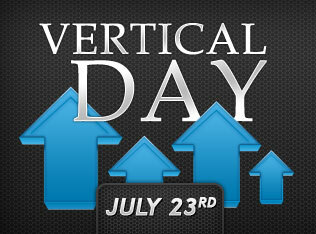 It’s “Vertical Day” at Mike Huckabee’s website. The former campaign website has been transformed to become the new home for Huck-PAC, and promises to endorse the candidates who will support the ideas and efforts the Huckabee campaign. And, it’s off to a great start. “Vertical politics” relate to issues which are neither Left nor Right, but seek to lift everyone “Up”. If you followed my campaign for President than you may remember the first “Vertical Day” we held on September 24 of last year. On a day when many said we should have focused on our fundraising for that “all important” 3rd quarter financial report, we instead focused on the issues. I blogged about the issues, answered questions about specific issues and used video to speak to voters about issues important to our campaign. We also featured guest blog posts from key supporters of the campaign, supportive bloggers and a guest post from Newt Gingrich. We had a great time and received lots of positive feedback from supporters. The campaign also featured a post from this blog. Cool, huh? -How would you control spending in Washington? -How would you make America energy independent? -What would you do to improve our education system? -What would you do to improve our health care system? -What sort of tax reform do you think America needs to boost our economy? -What steps would you take to promote conservation and good stewardship of the environment? Weighty issues, indeed. Here is where I would begin on the economy/tax reform/business ethics question…..
President Bush is catching some flak for saying that the core of our economic problem is that “Wall Street got drunk.” I think there is a lot of truth in that very blunt assessment. And, within that assessment lies the key to possibly fixing the problem. Derivative investments, with their lack of transparency, and lack of a consistent method for fair valuation are a ticking bomb which threatens to wreck our economic system. Here is what I propose to begin getting back on the right track. Tie executive compensation directly to the derivative investments held within that company’s asset portfolio. Compensation over and above $1,000,000 per year must be paid out in the form of these financial products, as valued on the company’s most recent 10-K. In addition, instead of granting incentive-based stock options in company stock, require that companies first use their existing portfolio of derivatives. The way I see it is, if these “financial products” are good enough to invest the hard-earned stockholder’s equity in, then they’re good enough to pay the top execs with. Oh yeah, and those multi-million dollar severance packages? You guessed it. Forget paying those out in cash. Pay them out in “financial products” instead. Obviously, the derivatives problem is not going to go away overnight. But, I’ll wager that if the top execs understand that the gravy train is over, and their own compensation will be directly affected by dabbling in these disasters, then they will begin to address the underlying challenges of transparency and valuation. Sound too simplistic? Well, sometimes the simplest solutions are the best. Trackposted to Perri Nelson’s Website, Rosemary’s Thoughts, The Beauty Stop, Maggie’s Notebook, Right Truth, Shadowscope, DragonLady’s World, The Amboy Times, Leaning Straight Up, Cao’s Blog, , Democrat=Socialist, Conservative Cat, Faultline USA, Allie is Wired, third world county, McCain Blogs, Woman Honor Thyself, DragonLady’s World, Walls of the City, The World According to Carl, Pirate’s Cove, , The Pink Flamingo, Gulf Coast Hurricane Tracker, CORSARI D’ITALIA, Dumb Ox Daily News, , and Right Voices, thanks to Linkfest Haven Deluxe. I remember that post. It was only September, but it seems so long ago, now. This election cycle has gobbled up so much time and energy, and it’s not even Labor Day yet. I’m glad to see Mike staying active in the idea development of the conservative movement. Conservatives aren’t welcome at the McCain dining room table, at this time, but that could change if he and B-HO stay tied after the conventions are over. At least, in a pandering mode. As for derivatives and GIC’s, I have tried to read up on them, but the codes make my eyes glaze over. Since I don’t understand them well enough to comment on them, I would agree that severance packages to departing executives should be tied directly to the income producing aspects of a company. Be that GIC’s or stock, but using cash on hand to pay out severance packages is not what I would call proper. However, I still think the boards of corporations, and their stockholders should be the one’s to decide. I know people who have made a living out of being proxy brokers, and compensation packages would be a natural place for them to be involved in any stockholder disputes over compensation. Bloggers: Heres what happens when you stand against the Islamification of your own neighborhood in Great Britain.